Milton Gallagher was born on 1st of September 1942 in Inglewood Western Australia, the second born of six boys to parents Francis and Lucy Gallagher. Milton’s father was a forester and the family lived in the forestry settlement at Dwellingup, Western Australia for many years and then moved to another settlement at Wanneroo. His maternal grandfather, William Plunkett always lived with them and he was an axeman who competed until age 80. With a family history in the sport dating back to 1898, it was only natural that Milton would follow in their footsteps and compete in the sport himself. The Gallagher family now has 100 years of participation in woodchopping. 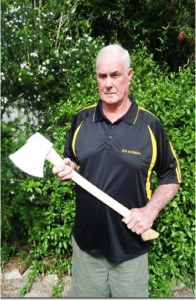 As a strapping 6’3½” well-built 16 year old, his first chop was in 1958 at the Bindoon Show in the “Mugs” chop which was a 10″ underhand. Milton won this event with the grand prize money of 6 pound. His grandfather had paid the nomination entry of 5 pound. Underhand events continued to be his favourite. He competed continuously for 44 years, before retiring due to health concerns. At the age of 18, Milton and his brother drove and old Austin A30 ute, top speed of 80km/hr to all the country log chops with their ‘Pop’ and his pipe sitting in the back of the ute. This went on to be a family tradition for many years until brother Stan updated to an X2 Holden so that they could fit brother John in as well and all travel together. Milton has worked in the timber industry as a faller, log hauler and log inspector. He is now retired. 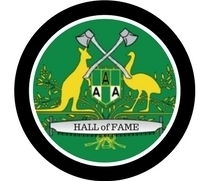 Milton was the handicapper for the Progressive Axemen’s Association of Western Australia (PAAWA) for 20 years, as well as getting the logs and carting them for competitions. He now holds a life membership with the PAA. Milton has been married to Cheryl for 47 years and has a son Todd who currently competes and a daughter Kellie. He is the proud ‘Pop’ to four grandchildren. His passion for the sport continues with the Royal Show Committee, Ring Judge and following son Todd and helping him prepare his axes. First major win. Gerry Connell U/H Donnybrook 30/03/1964. Major prize money. Paid for new car. Won the Combination Championship – Pemberton. Made the Australian Title Final 14 inch 1973. Represented Western Australia in the State Team. 1968, 1974 & 1983. Competed around Australia, including Adelaide Show and Tasmanian Christmas Carnivals. PAA Club Champion 3 times. WAAL Club Champion 1 time. PAA Life Member. Currently on the Royal Show committee and Ring Judge. WA Council Delegate from 1980 for approx. 20 years.